Had a strong long bias today and tried to beat my “bete noire” – trending up days. I think I had some success – got out with 4.75 points – although the move was good for another 7 points! I just gotta face it – I like taking profits. And will never be able to hold through the chop of an 8-10 point move. Oh well, like those canny Greeks say: “know thyself”. If you liked that then check out: Part 2, Part 3, Part 4, Part 5, Part 6 and Part 7. 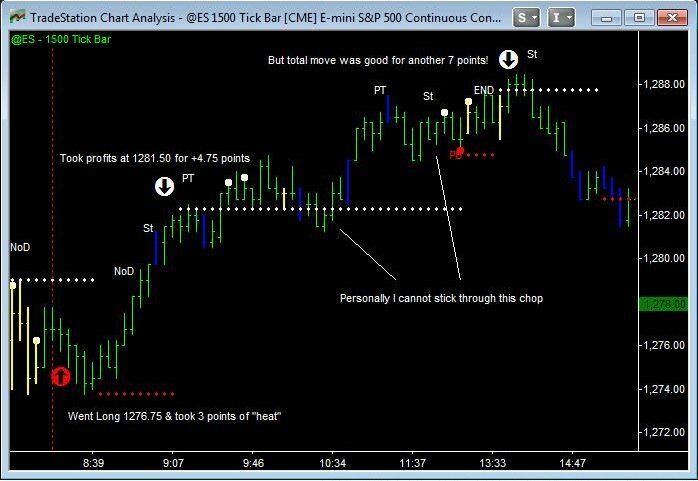 Fantastic – another trader making it full-time. “Hi Barry, I hate to say it but, come the Revolution, I think us traders will be amongst the first against the wall … nice people or not. Most people don’t know the difference between what bankers do and how we earn our keep. So let’s make hay while the sun shines! Have to agree David – whenever they start blaming the “speculators” – it’s just so shallow. Shows no understanding of how markets work, what speculators do and they just swallow the line that politicians feed them, hook, line and sinker.